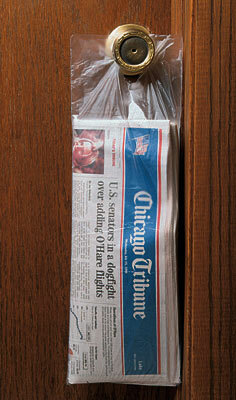 Keep newspapers, magazines, brochures, coupons, and other literature clean and dry. High- and low-density styles have doorknob hang holes and are mounted on corrugated headers for quick and easy loading. Condensation is prevented through bottom corner vent hole. Perforated for easy tear off. Pads contain 100 bags. Usable width is 1/2" less than bag width, and usable length is 3" less than bag length.